Head coach of the national football team Park Hang-seo is determined to help the U23 team overcome the qualifying round of the upcoming 2018 Asian Games (ASIAD 2018). He made the statement during a ceremony in Hà Nội to announce Việt Nam Professional Milk JSC (VPMilk) as official sponsor of both the Vietnamese national team and U23 team. At the ASIAD 2018, Việt Nam’s hopes are high after coming second at the 2018 Asian Football Confederation (AFC) U23 Championship held in China early this year. 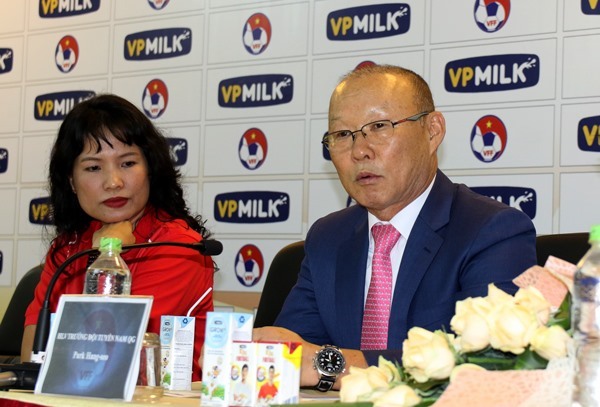 General Secretary of the Việt Nam Football Federation Lê Hoài Anh said he believes that with the support of VPMilk, athletes can enjoy better health to compete in the tournament. VPMilk Director of External Relations Nguyễn Thu Ngọc said they are proud of the team’s success and as such the firm has decided to continue partnering with the national football team for the second consecutive year. The event will take place in Indonesia from August 18-September 2, with a record 32 men’s football teams registered for the competition.